A couple months ago, I took the Basic Firearms Safety Course at the Massachusetts Rifle Association (MRA) in Woburn. I passed the NRA test without an issue. I procrastinated for about a month, then I called my local licensing officer at the Braintree Police Department to set up an appointment to drop off “the packet.” The appointment was this morning and I think everything went well. Officer Jack Twohig informed me that the process usually takes about 4-6 weeks. He will be able to start the process today for me but I need to show proof that I have a gun club membership as soon as possible. If I wait too long, my application will get denied. So tomorrow night, I am going to the MRA to sign up. Daniel and I are happy to announce that we have (finally) decided on when to get married. We plan on tying the knot next summer (August 11, 2012). We would like to have the wedding on Plum Island, which is a very special place to us. Plum Island is a small barrier island just off the northeast coast of Massachusetts and is part of Newbury, Newburyport, Rowley, and Ipswich. The island is separated – barely – from the mainland by the Parker River; the northern tip is at the mouth of the Merrimac River. Most of Plum Island (the southern part) is the Parker River National Wildlife Refuge, but the northern portion is densely settled with both year-round and seasonal residents. Virtually the entire oceanfront is beautiful public beach, although much of it is accessible only by foot. There are boardwalks in the Refuge that take you through the dunes and out onto the beach. Parker River National Wildlife Refuge is the place we go to frequently for birding and biking. The inland side has some neat marshes with a continually changing population of birds ranging from plovers, blackcap chickadees, redwing blackbirds, killdeer, egrets, gulls, great blue herons, and occasionally snowy owls. I chose the first method: tripod and self-timer. I setup the Manfrotto tripod with my Nikon D5000. I went out to the balcony while the sun was still up. First, I set up the camera in the spot I wanted. I then stuck my hand out as far as I could and used Manual mode to focus in on my hand. The hand indicated where I would be standing (well, supposedly anyway). The camera doesn’t need to focus on the subject the photo will be a shot of (my face). It just really needs to focus on something that is the correct distance from the camera. I guessed; I was a little off though. Others suggested that you could use a stand in, such as a friend, or even a stuffed animal, to get the correct focus. I think it came out well, except that my face is out of focus (but ears are focused). I guess I stood a tiny bit too close to the camera. Oh well – attempt # 2 will come soon. 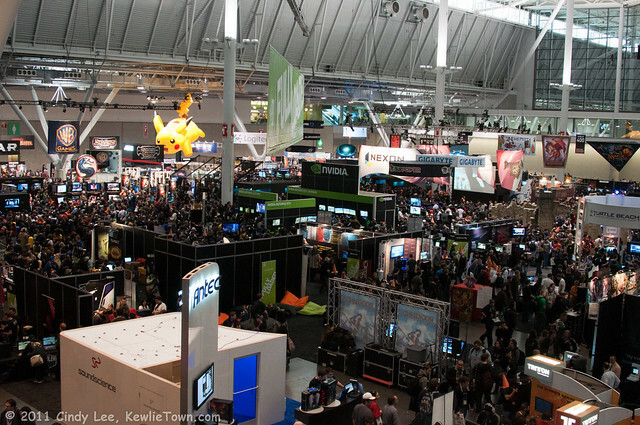 Pax East is a 3 day gaming convention in Boston, MA. 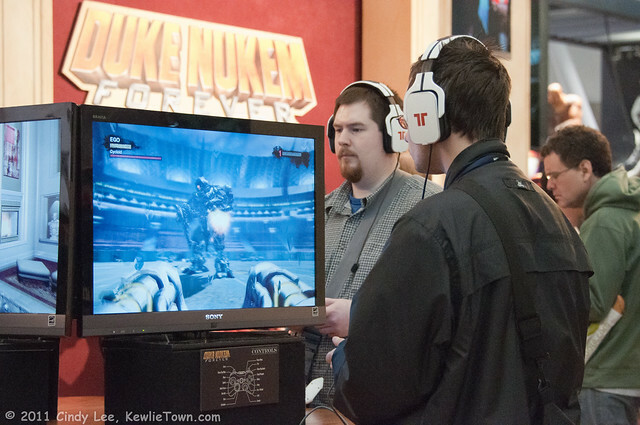 There are free console and PC play areas, along with classic console and arcade rooms. 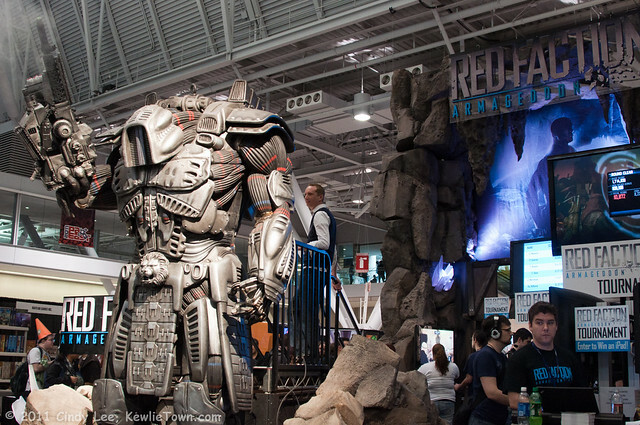 In the main exhibit halls, some of the most well known game dev companies are represented. They bring their best and new products to show off to the gaming community. Microsoft, Capcom, Ubisoft, Turtle Beach, Tritton, Nintendo, Valve, EA, NVIDIA, Alienware, Logitech, and WB Games, were just some of the bigger companies. 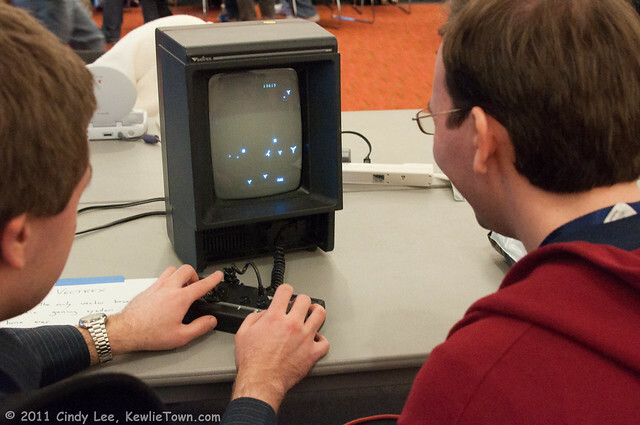 There were also some indie devs. I had a 1 day pass for the convention for Friday. I was by myself for most of the day so I didn’t really want to wait in the lines alone. I did get into some shorter lines such as for the Nintendo 3DS. I actually got in 2 of those lines – one for Resident Evil: The Mercenaries 3D and Super Street Fighter 4 3D Edition. I also played Castle Crashers on the PS3 in the form of an arcade cabinet. I probably got in a few more short lines but I don’t remember for what. There were some cosplayers that I saw but I wouldn’t say there were many. It was probably because it was a Friday. There were tons of guys there and not many girls. Most of the female population there were “booth babes”. There was a really tall girl, cosplaying as C. Viper (Street Fighter). She looked awesome! Later on in the day, I saw another C. Viper that didn’t look very good at all…. I was expecting Sony to be there. They had a spot in the booth map that I saw – but I didn’t end up seeing them, I don’t think. I was hoping to get my hands on the new PSP2 aka NGP. 11/24 has been announced as National Opt-Out Day! I will be flying out of Boston Logan which, of course, has the backscatter x-ray machines. I get enough radiation from the dentist x-rays so it sounds like I will choose to opt-out of the scanners at the airport. An “enhanced pat down” probably won’t be horrible. I’ll just imagine myself as some sort of criminal. It will be my deterrent from becoming a bad guy someday. Check out Daniel’s blog post about the TSA. Last Saturday (11/6/10), I was invited to photograph the annual fundraiser for Wales Selectman, Mike Valanzola. Today, on the train into work, I was standing next to a guy with a bag and a bike helmet clipped to it. He constantly turned – don’t know what he was looking at – hitting me each time; never appologized. Then at one point, he dropped his arm from the pole to grab a book out of his bag. And yes, in the process, he managed to slam his arm into mine; again without appologizing. I spent the remaining time (standing next to him) trying to come up with the best technique to use on this douchebag should the perfect opportunity arise. I decided that a swift kick to the shin (or calf) or an accidental elbow to the kidneys would do the job nicely. Alas, a seat freed up so I took it. I still continued to plot though. Today we went to the Apple Store in Ginza, hoping to play with the newly released Apple iPad. Apparently, it’s not out yet in Japan or something as we didn’t see it in the store. After Apple, we walked over towards the Imperial Gardens. We stopped at the water park and watched the water fountains for a while. There was a seashell fountain that was pretty cool. After the break, we walked over to the wrong gate since Daniel forgot which gate people are allowed into. We saw a snake sunbathing on some rocks though. After we got a few shots of him, we headed over to Otemon gate (the correct one). We saw some swans, ducks, cormorants, and koi fish in the mote, as well as some weeping cherry trees along the banks. Once we finally made it to the Otemon gate, we saw several guardhouses that were used by samurai. We also stopped for some waffle ice cream. 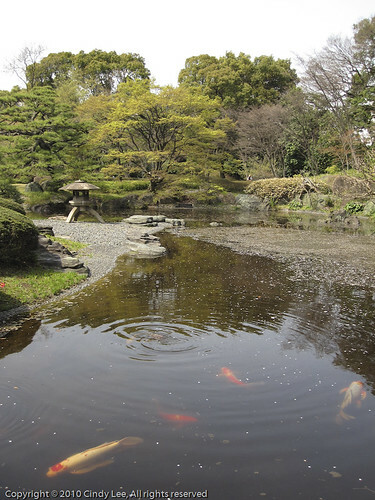 We then headed off into the lower parts of the garden which included lots of flowers and a pond. There were some people doing water paintings in the pond area. There were an abundance of cherry trees and bamboo. Behind the pond was a small waterfall. After the pond area, we ventured towards the upper parts of the garden. There was an octogon music hall for the Empress’s 60th birthday. There were bird designs on it. Across from the music hall was the old stone remnants of large watch tower that was built and burned in the 1600s. 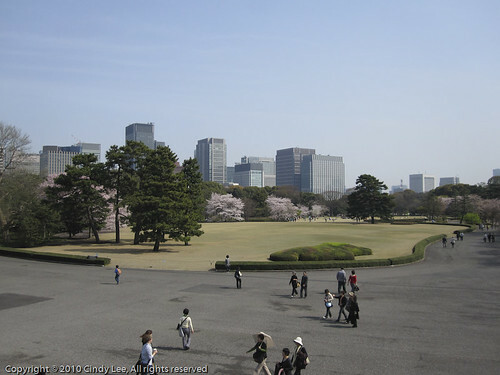 We were able to climb t o the top of it to enjoy views of both Tokyo and the garden grounds. We walked back down into the garden area and into the bamboo forest. I had noticed before but we were still not able to figure out what the strings between each bamboo was for. It was almost like a fence so you can’t walk through the bamboo trees. We tried to get more waffle ice cream from the other rest building but they seemed to have sold out since the freezers were completely empty but we saw people eating them. After we left the Imperial Gardens, we walked over to Tokyo Eki. Apparently, the Tokyo station building looks like a British type building. Too bad it was under renovation so I wasn’t able to see any of the building. So we hopped on to go to Harajuku for some crepes but when we arrived, we went into Family Mart for some waffle ice cream first. We sat and people-watched for a while. There was a foreigner with a couple Japanese translators (mom and daughter?) talking to some cops. More and more cops showed up; eventually an ambulance arrived. We concluded that the foreigner was injured since we saw him limping a bit towards the amulance. The amublance eventually took off with him. That entertained us for a while. We then noticed some dude with a white straw hat, black rim glasses and a lot of tattoos, recruiting girls at the same intersection we were people-watching at. We watched him work for a while. Eventually we decided to follow him but we finally lost him when he went down some side streets. After stalking the straw hat, tattoo guy, we gave up on crepes since the waffle ice creams we had gave us tummy aches. We decides to walk to Shibuya to find some dinner. We stopped at a street vendor thad selling egg cakes. We ordered and paid for 12 but insisted on giving us extras. Some of them were stale but overall yummy. I think the stale ones were the ones that gave me a massiv stomach ache though. We walked around Shibuya and went into a yen shop (dollar store) looking for onigiri molds but we came out empty-handed. We looked for an Italian place for dinner but didn’t find one so we decided to take the train back to Harajuku and try the “Italian Tomato”. We both had spaghetti with meat sauce; it was decent. After dinner, we went back to the hotel for the night. When we were ready for bed, Daniel set up his camera once again with his new AC adapter from Yodobashi for his automated picture project (time lapse). Another foggy morning in Tokyo. The photo project Daniel set up last night (automatically shooting 1 photo every minute all night) didn’t work so well. His battery died in the middle of the night. He decided he needed an AC adapter for his camera so we went to Yodobashi Camera in Akihabara to get one. Today was a short day.